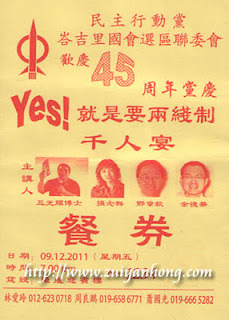 Johor Muar DAP Bakri Division will hold a dinner to celebrate the 45th anniversary of DAP on 09/12/2011. The venue of the dinner is at Yong Sheng Banquet Hall in Bakri, Muar. Speakers of the dinner listed are Johor Bakri MP Er Teck Hwa, Selangor Serdang MP Teo Nie Ching, Johor DAP President Dr Boo Cheng Hau, DAP Central Publicity Chief Dr Hew Kuan Yau and Speaker of Selangor State Legislative Assembly Teng Chang Khim. 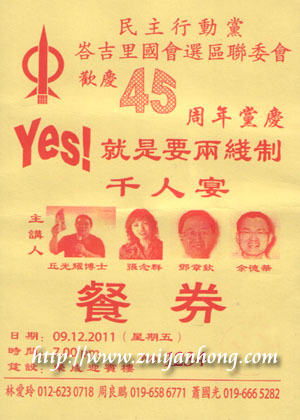 Malaysians should fully support Pakatan Rakyat so that government will not squander our hard-earned money.